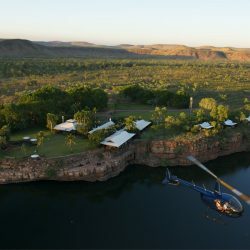 The HeliSpirit Luxury Helicopter Safari is chosen by Globus Switzerland as one of the top ten unique world travel experiences – it is the only Australian itinerary chosen – so why not holiday at home when the best is on your doorstep? 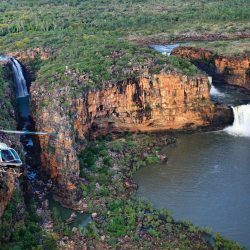 A 6 day, 6 night, unforgettable private helicopter safari exploring the stunning Kimberley and NT wilderness in true style. 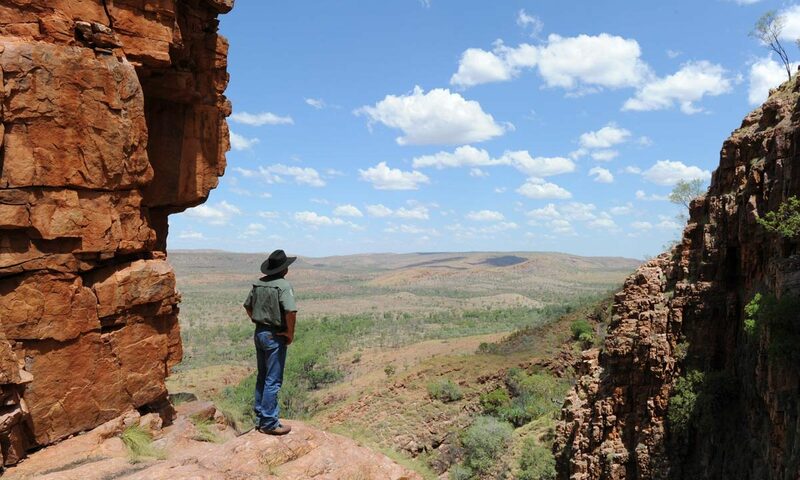 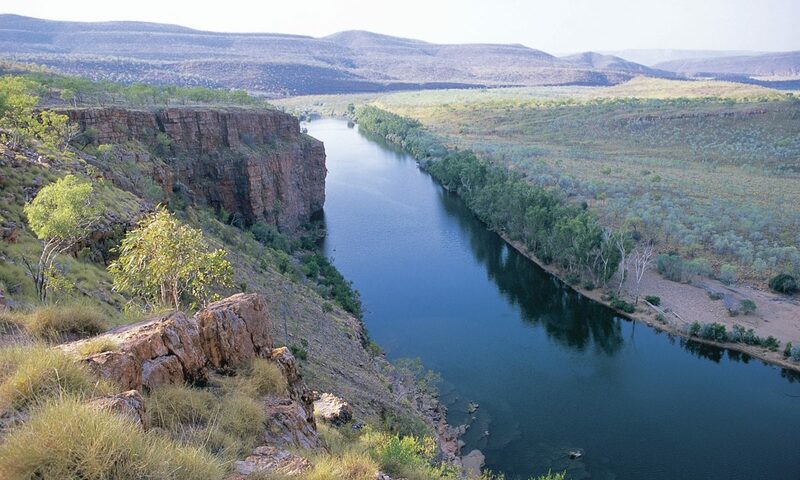 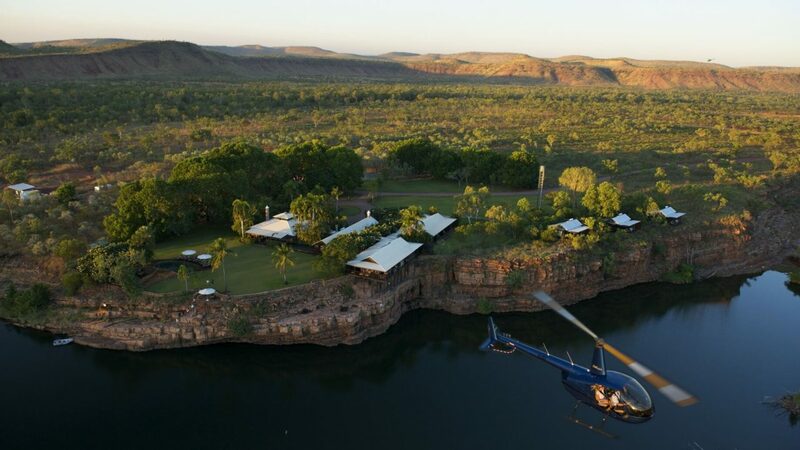 Enjoy views of the extraordinary Kimberley and NT from your private helicopter. 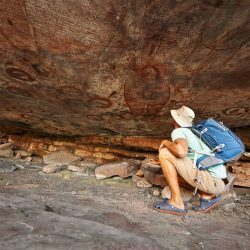 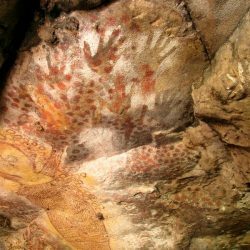 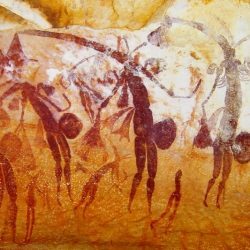 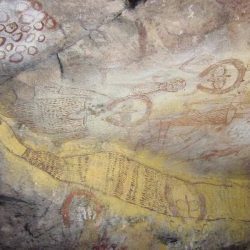 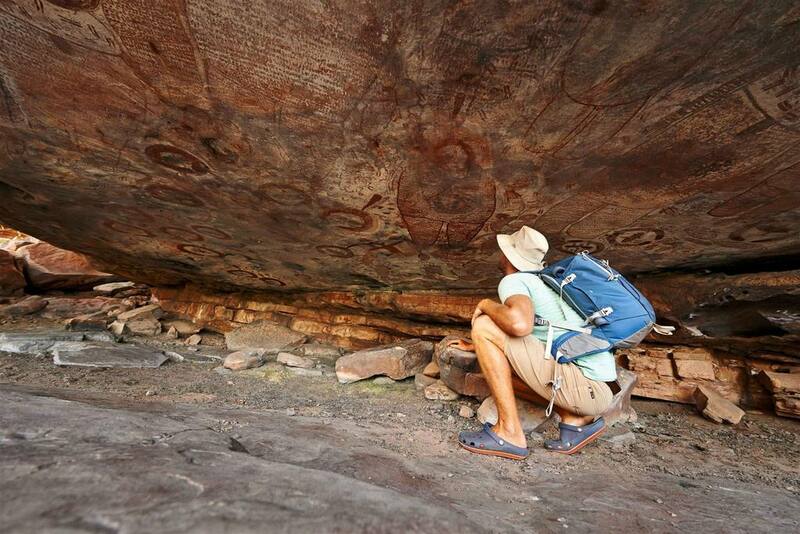 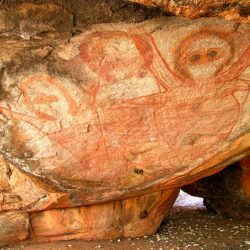 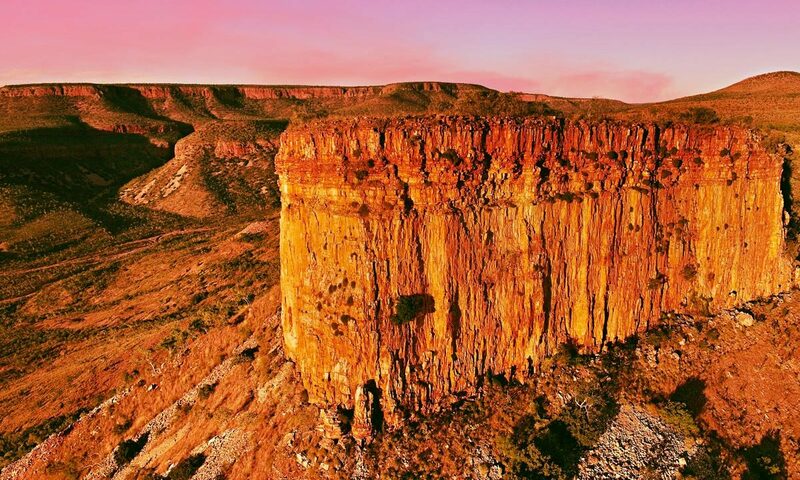 Land on a mountain pinnacle to watch the sunset over your favourite cold drink, fish in wild rivers, view galleries of the oldest rock art on earth, soar through gorges and touch down to swim in secret springs and waterfalls. 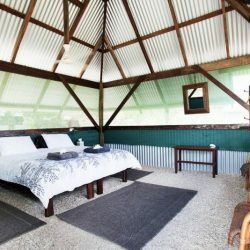 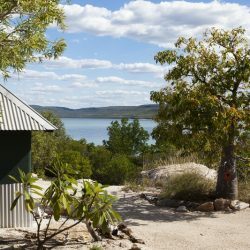 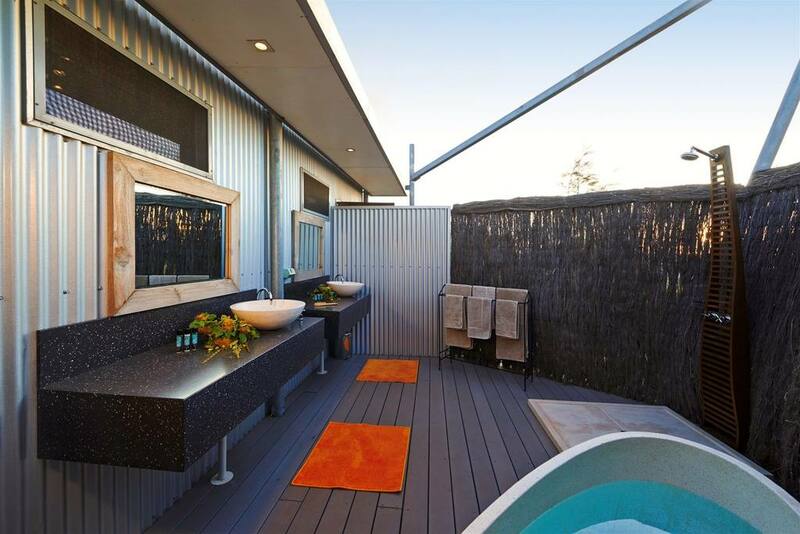 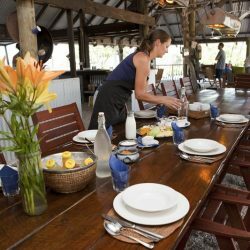 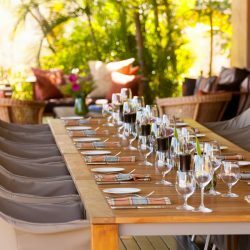 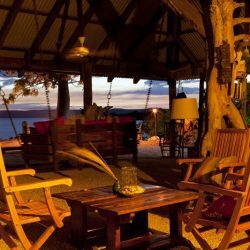 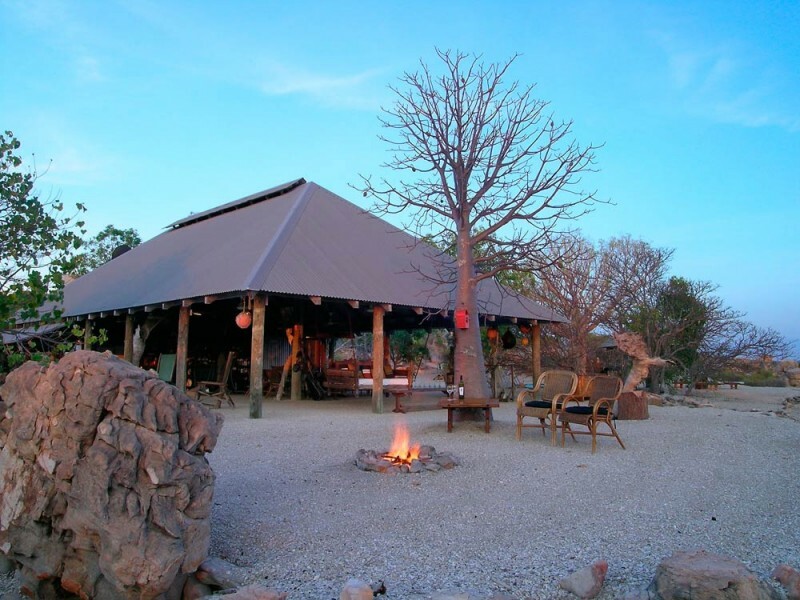 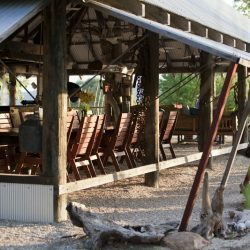 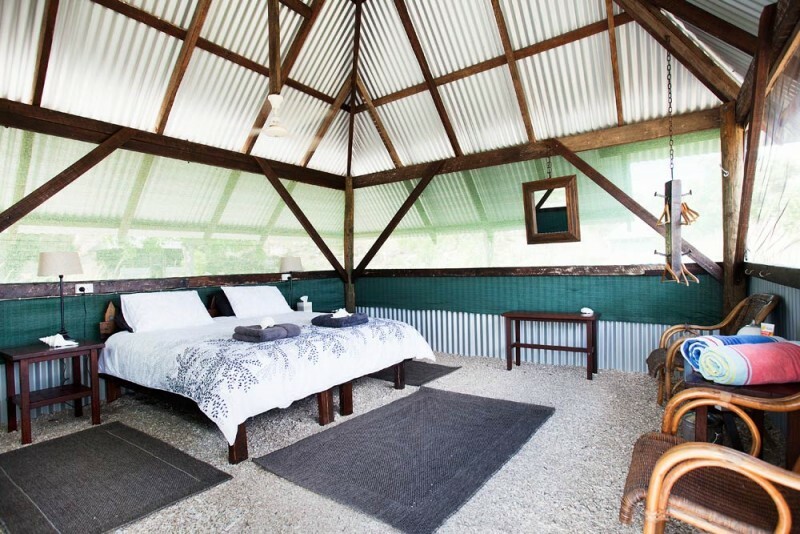 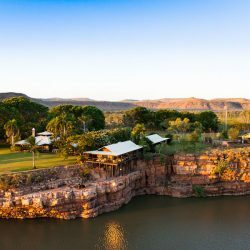 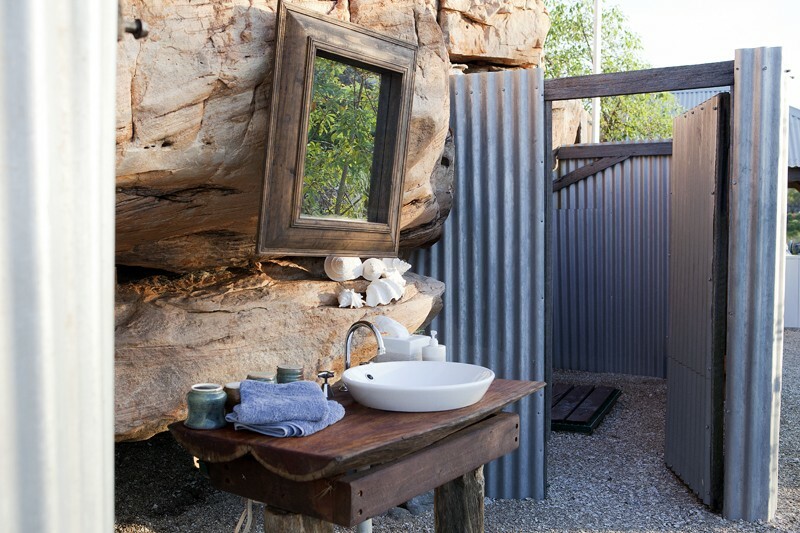 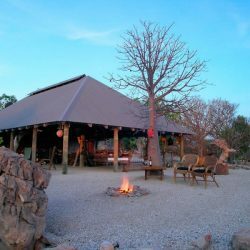 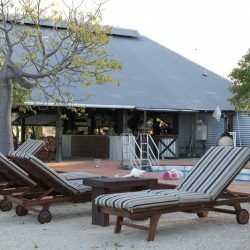 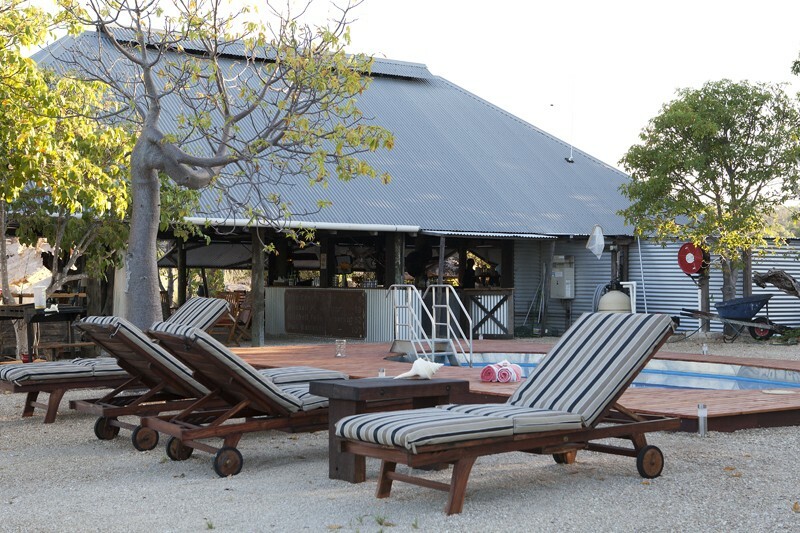 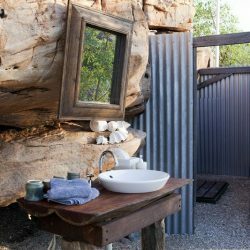 Your accommodation is in three fabulous and unique wilderness retreats: Bullo River Station, Kimberley Coastal Camp and El Questro Homestead. 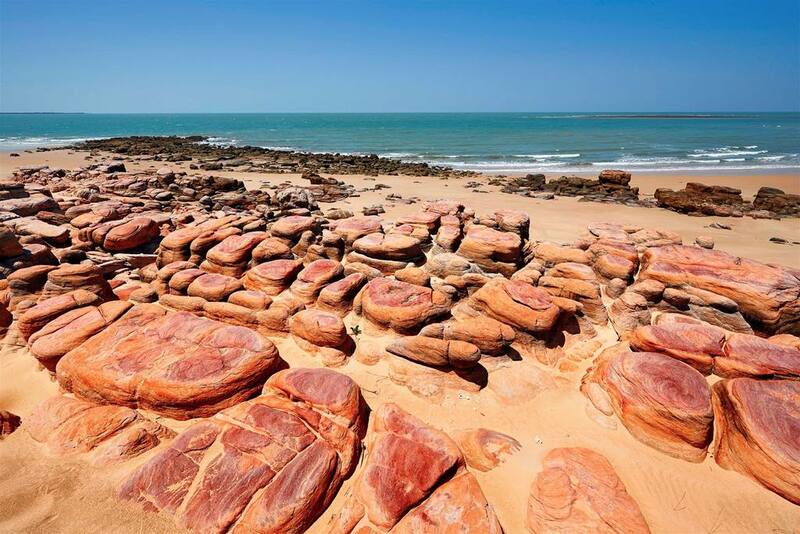 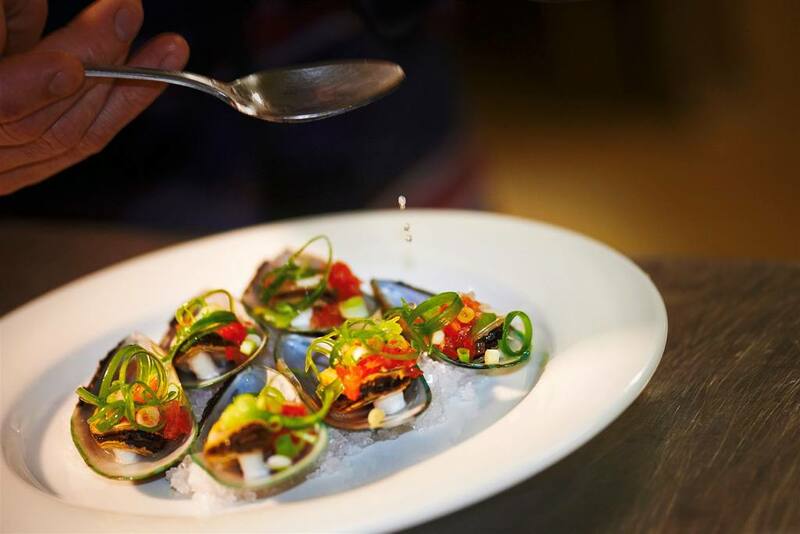 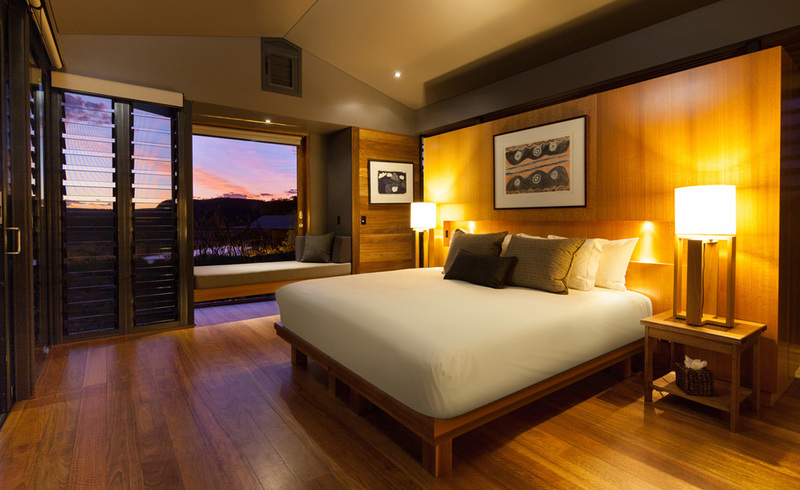 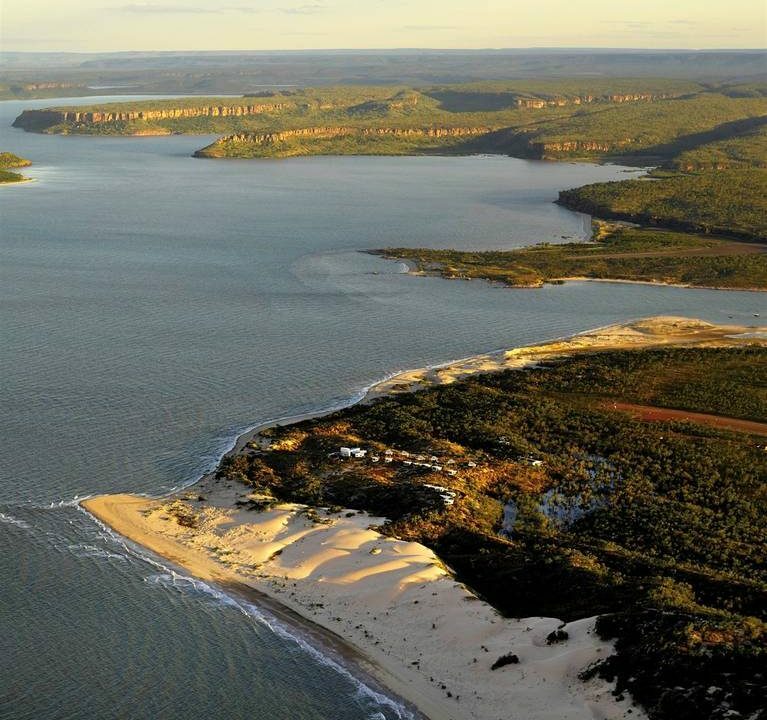 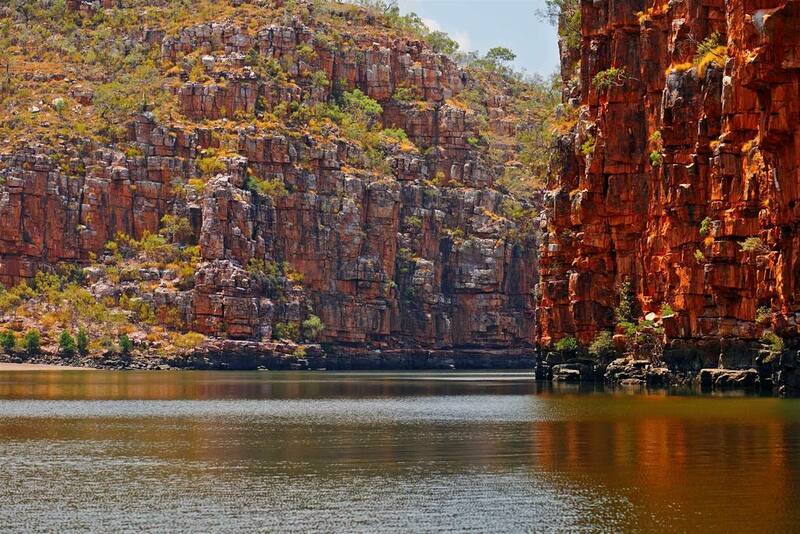 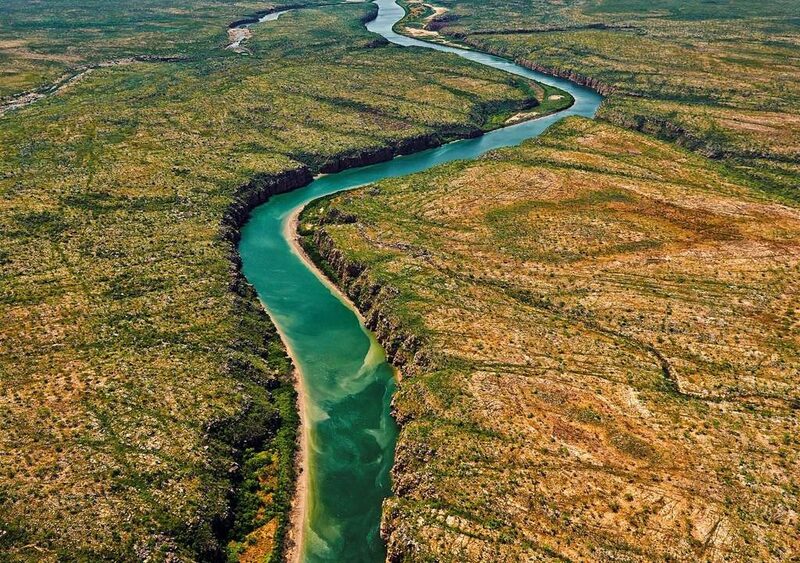 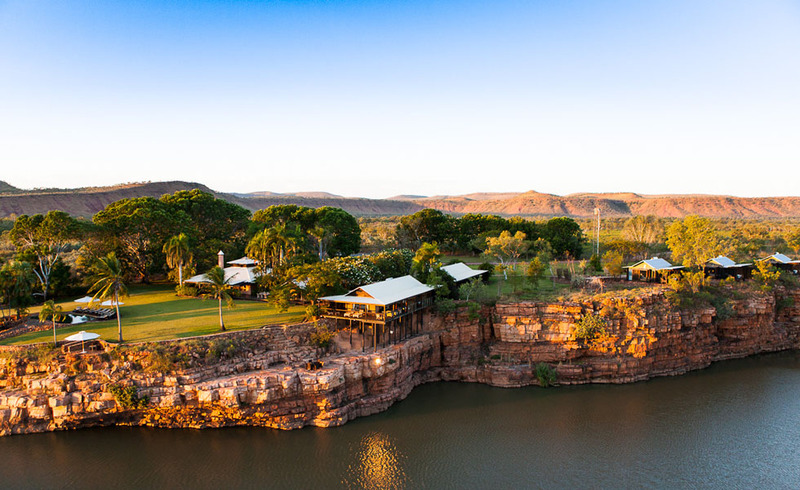 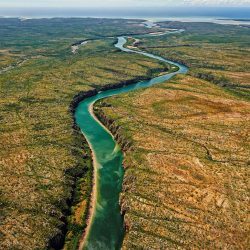 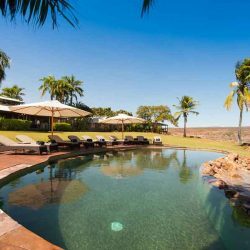 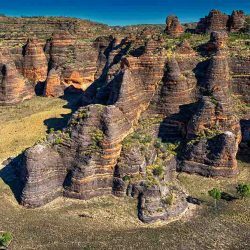 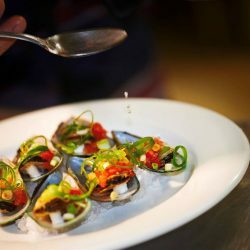 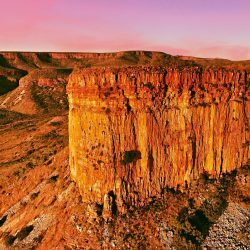 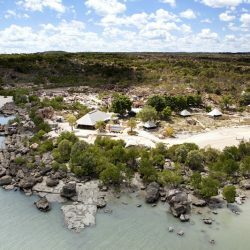 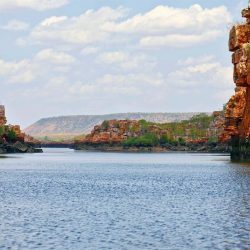 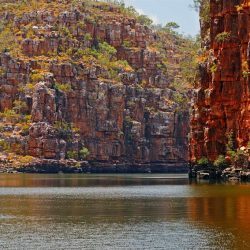 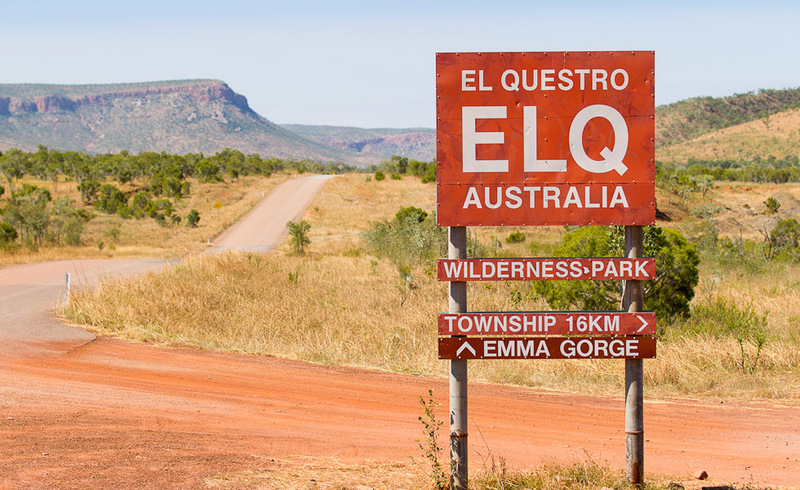 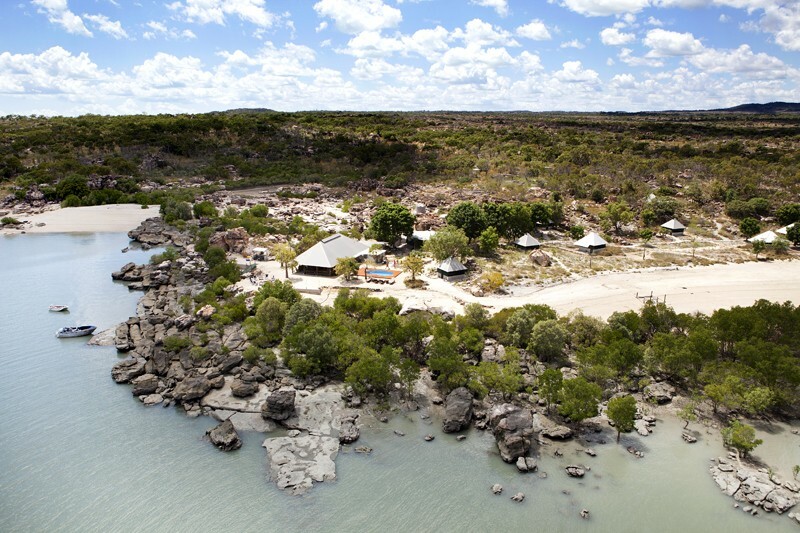 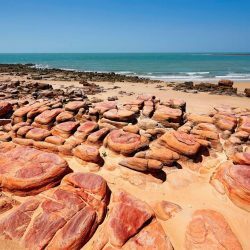 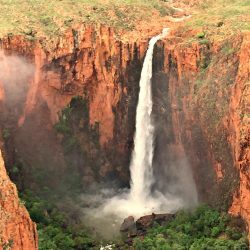 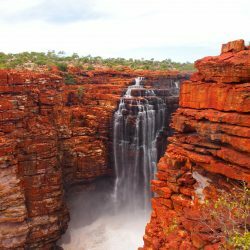 All three are in exquisite locations offering diverse wilderness experiences; experience a working cattle station at Bullo River in the NT, fish the Timor Sea at Kimberley Coastal Camp and beautiful gorges at El Questro. 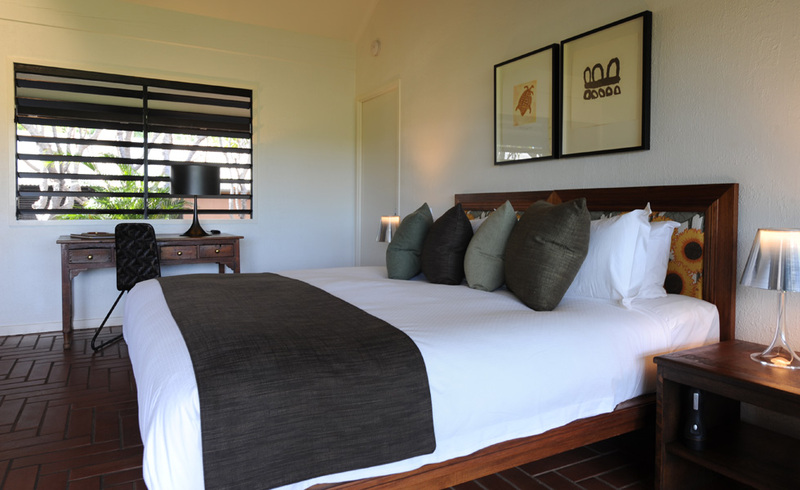 Freshwater Apartments in Kununurra provides our deluxe pre-tour accommodation. 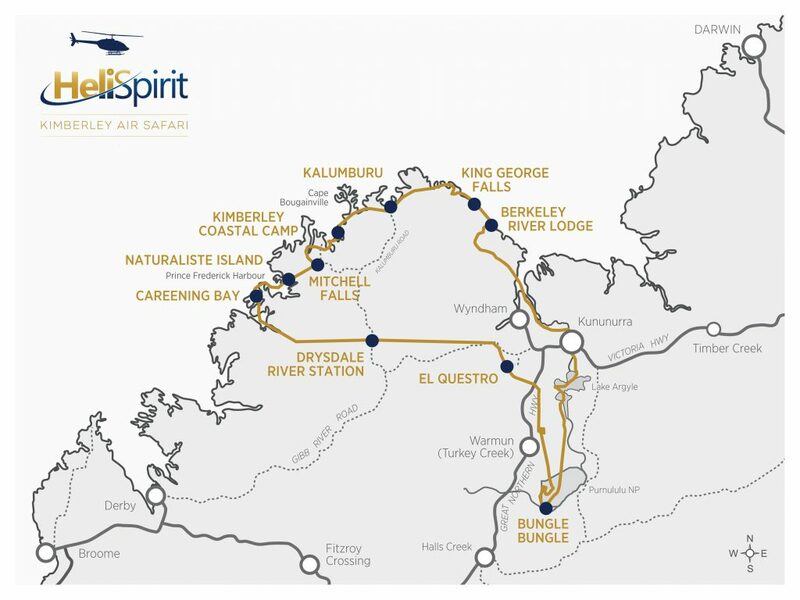 HeliSpirit Luxury Helicopter Safaris operate from April through to October. 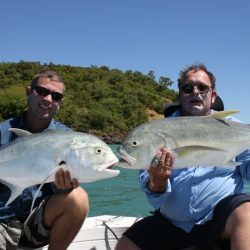 These are private adventures where the pilot is your host and guide just for your personal group. 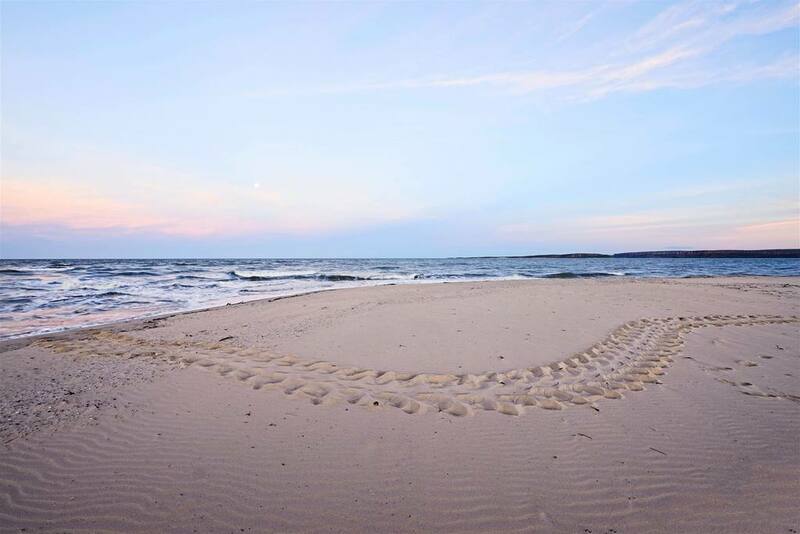 Choose the dates that suit you. 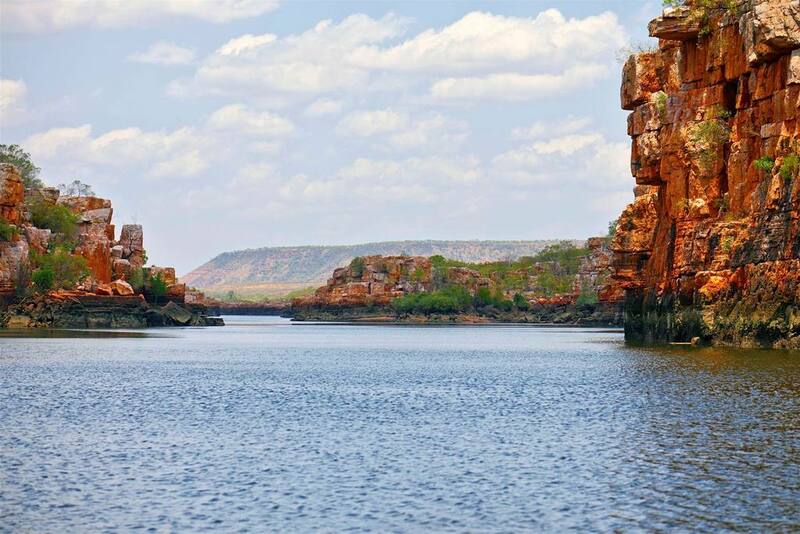 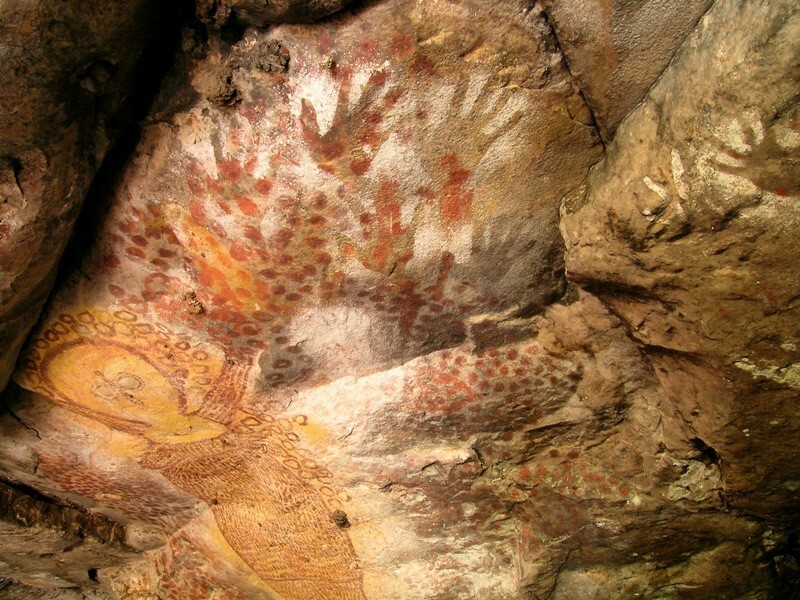 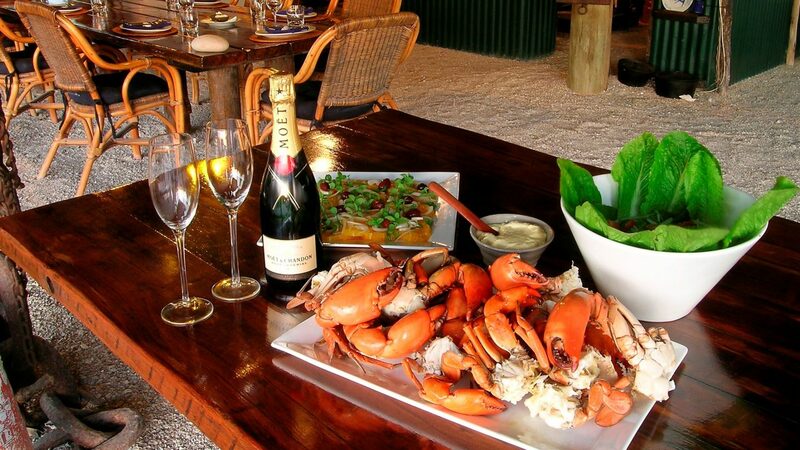 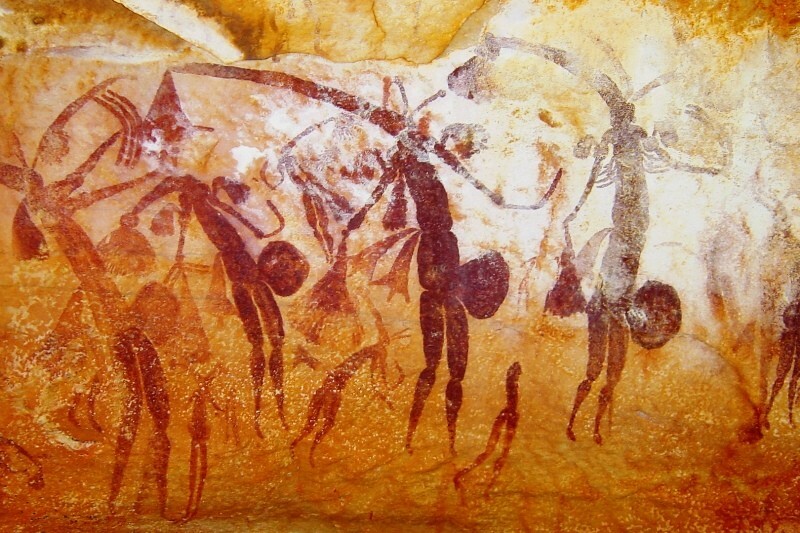 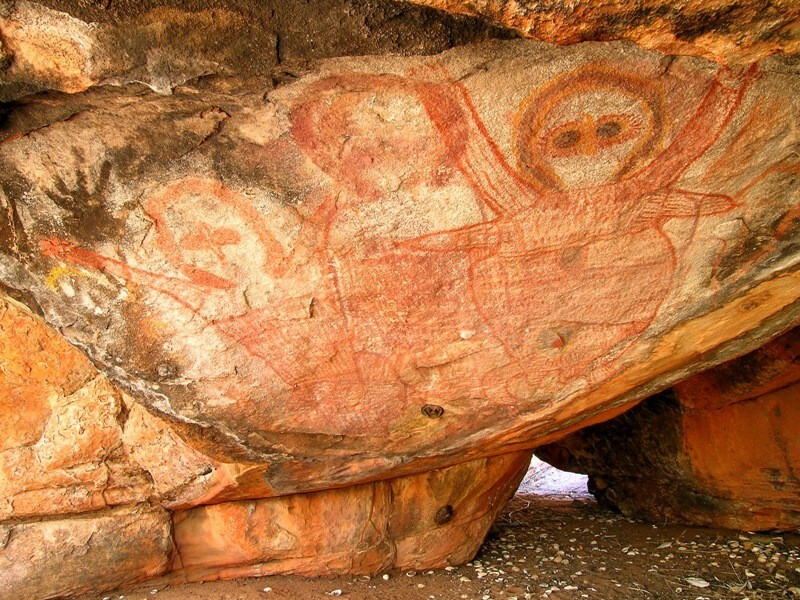 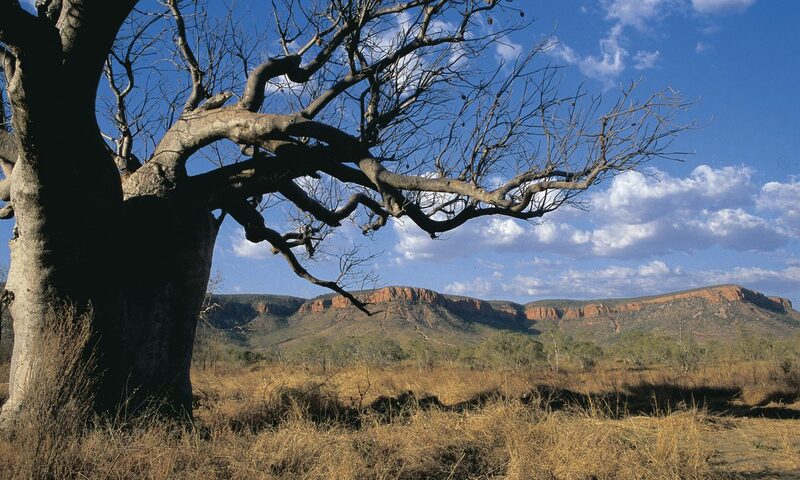 *The Kimberley and NT Safari: $19,900 pp twin-share fully inclusive. 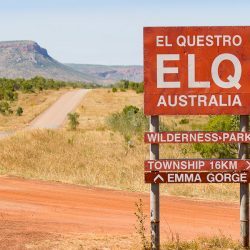 Accommodation is: 1 night pre-tour at Freshwater Kununurra, 1 night at Bullo River Station, 2 nights at Kimberley Coastal Camp, 2 nights at El Questro Homestead. 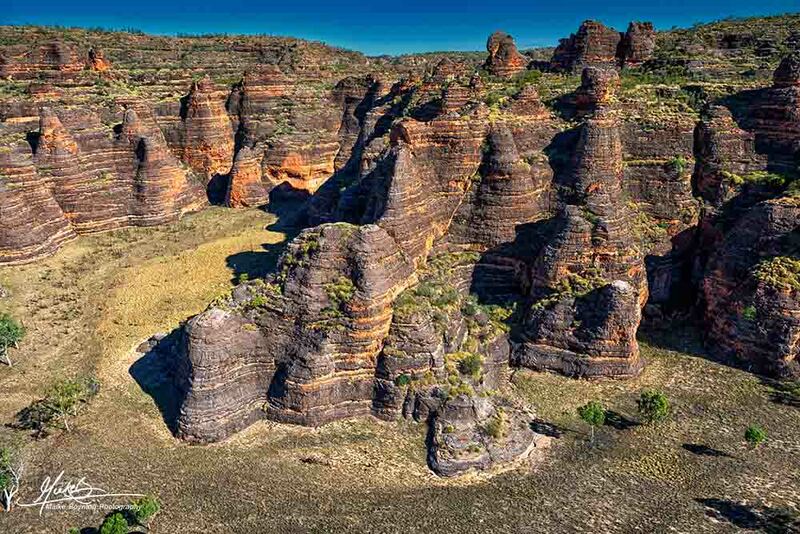 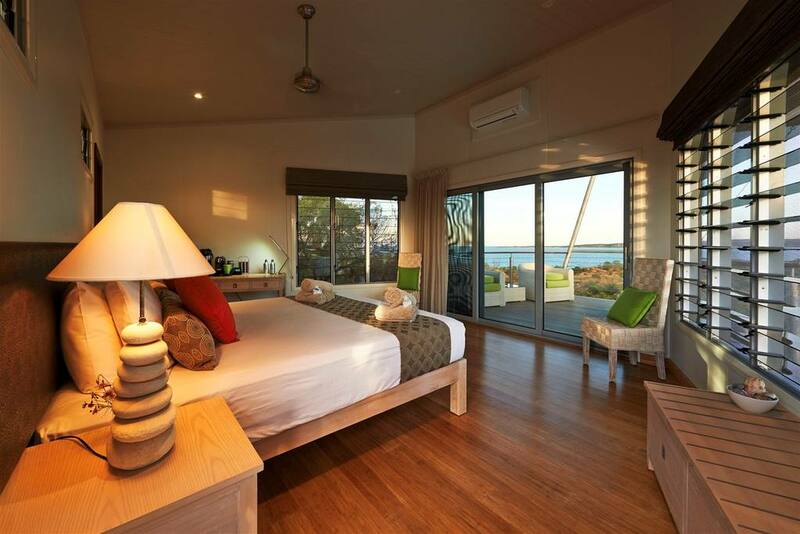 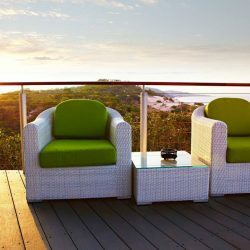 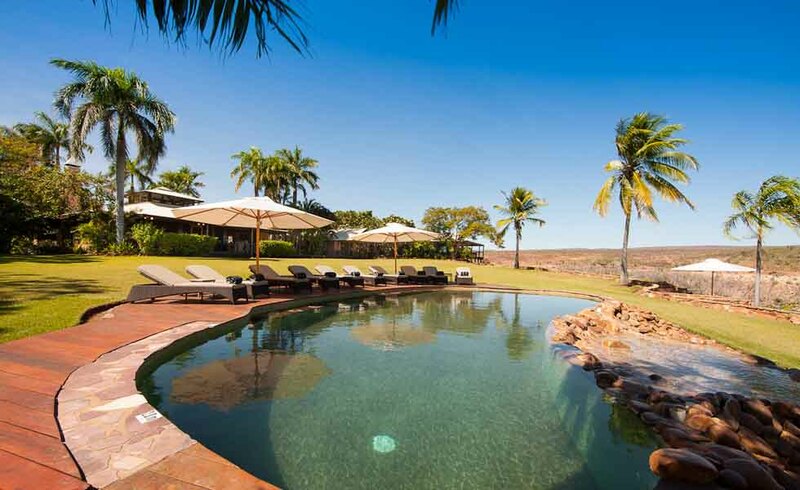 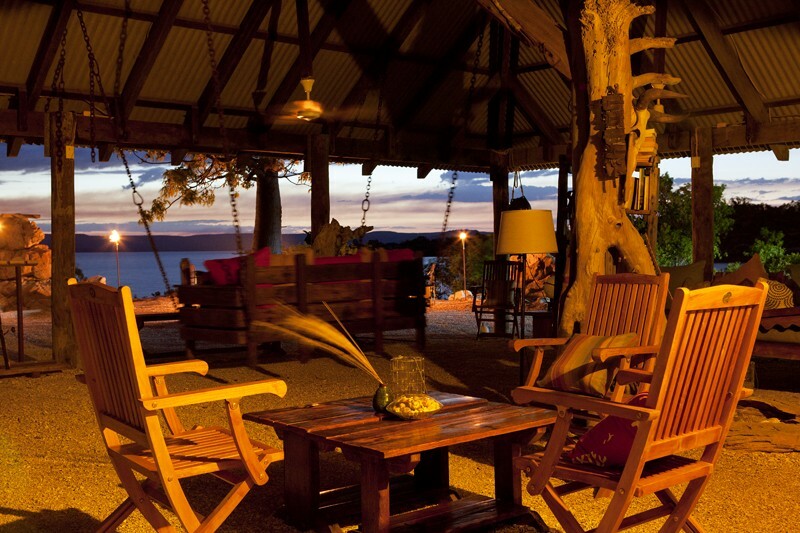 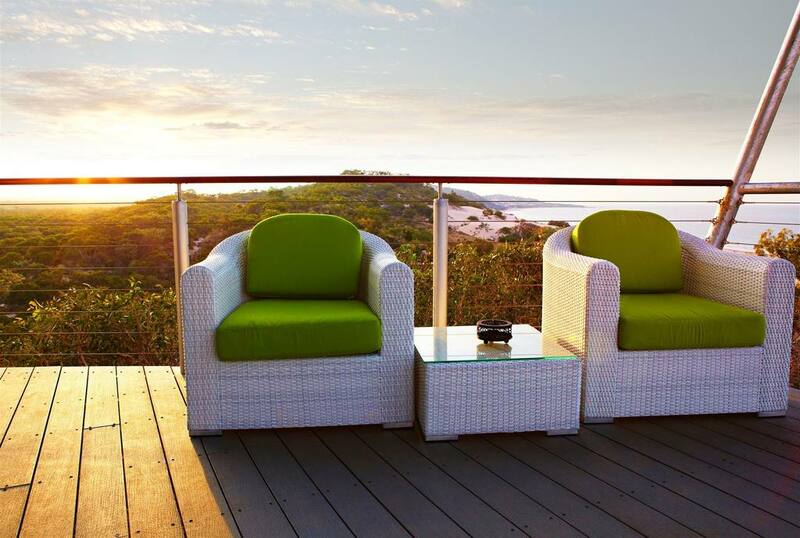 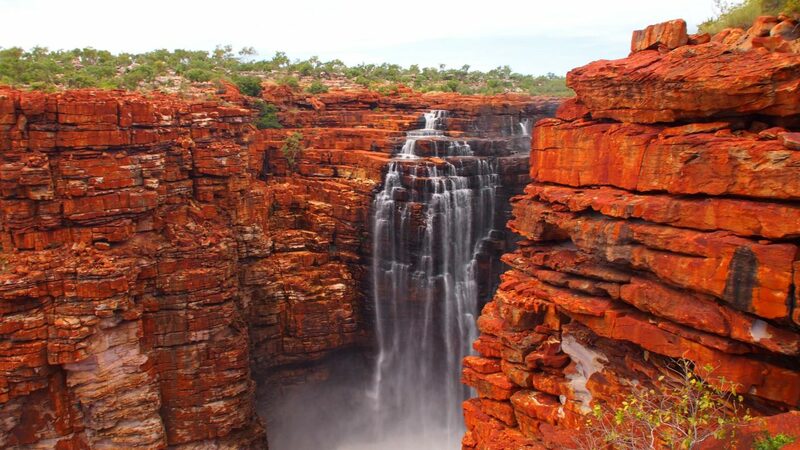 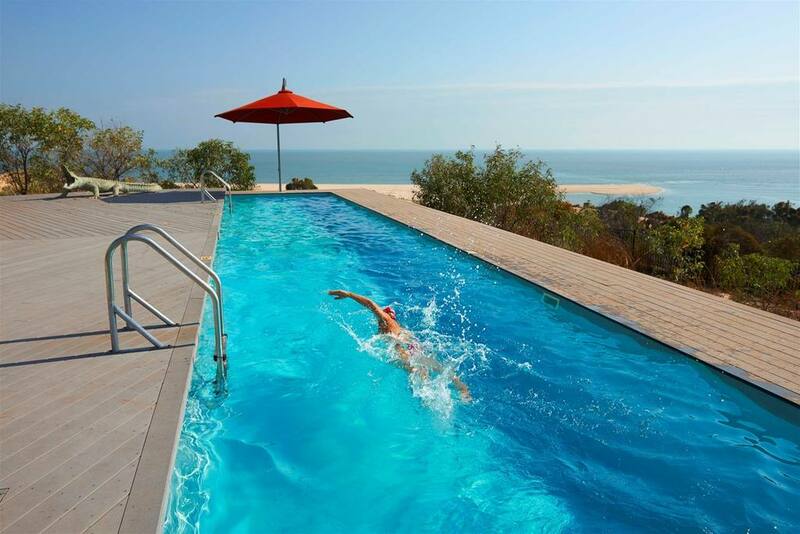 The Kimberley Circuit: $18,500 pp twin-share fully inclusive. 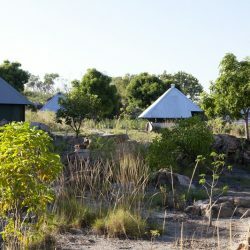 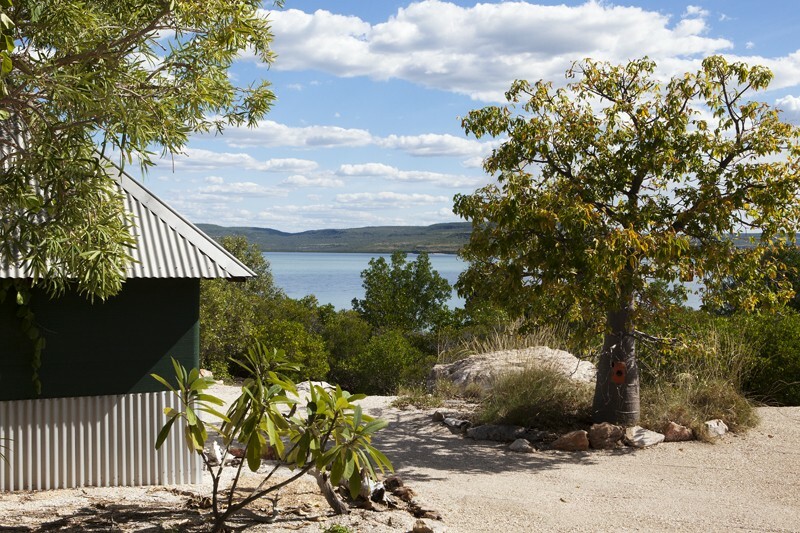 Accommodation is: 1 night pre-tour at Freshwater Kununurra, 1 night at Berkeley River Lodge, 2 nights at Kimberley Coastal Camp, 2 nights at El Questro Homestead. 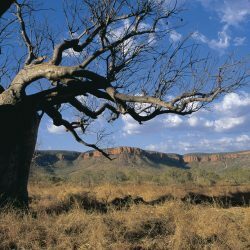 The Kimberley Circuit Family Safari. 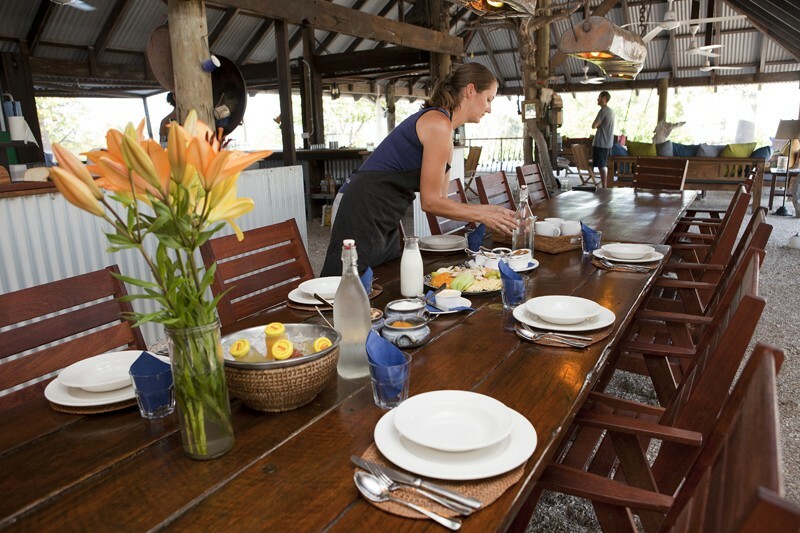 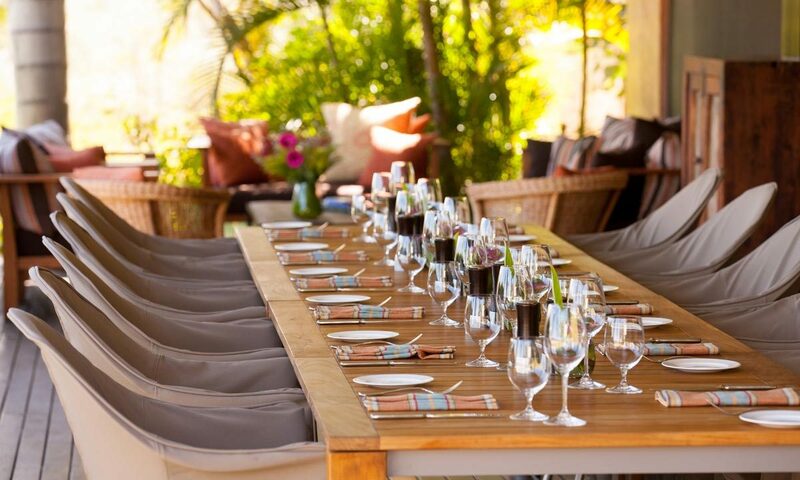 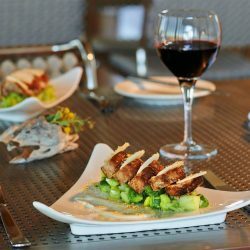 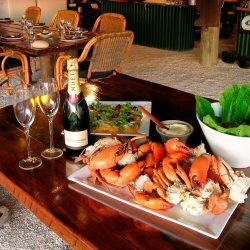 $12,900 pp with some meals and activities at your own cost. 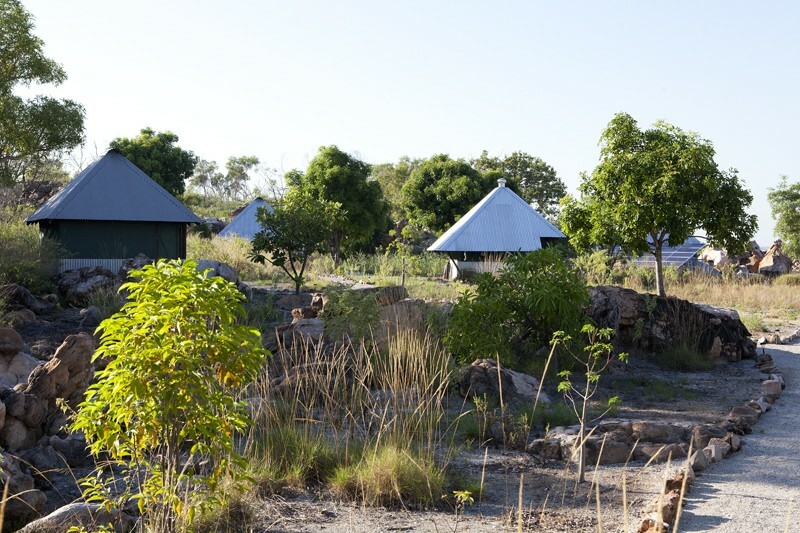 Accommodation is: 1 night pre-tour at Freshwater Kununurra, 2 nights Kimberley Coastal Camp, 2 nights Emma Gorge tented cabins El Questro, 1 night Bungle Bungle Savannah Lodge. 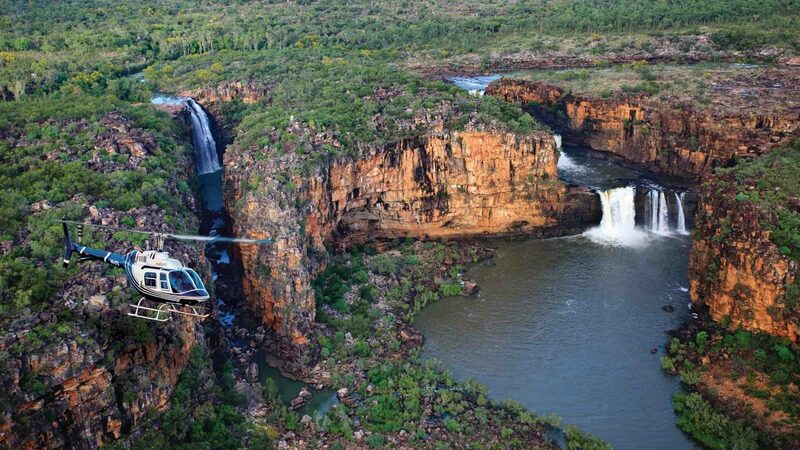 This price is calculated on 4 people plus baggage in one helicopter and is subject to payload limitations. 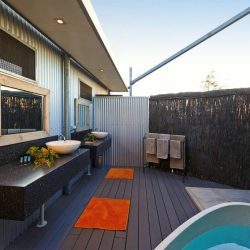 Typically it would suit 2 adults plus 2 children under 16 years old. 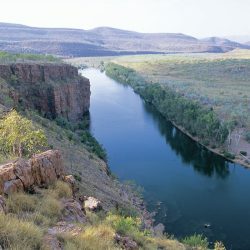 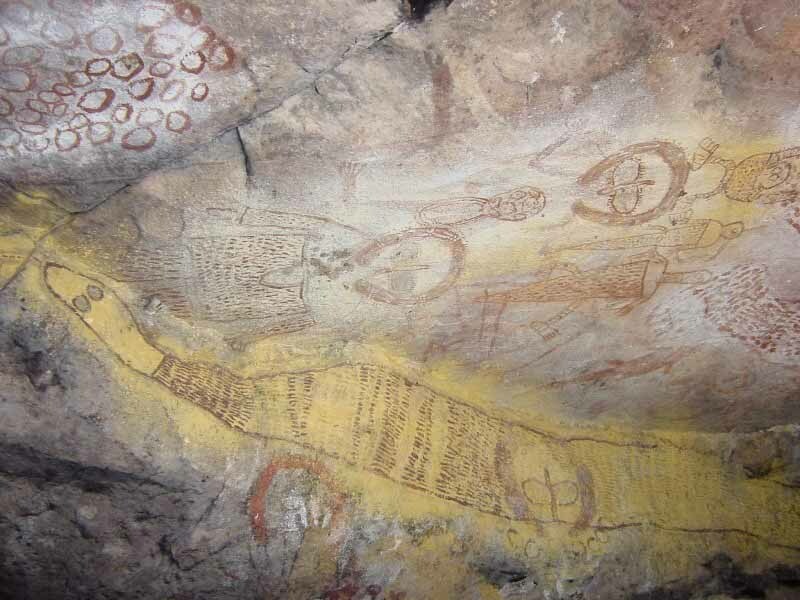 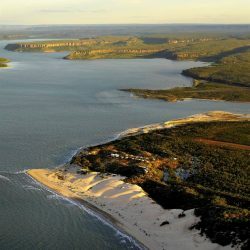 Some of the locations you will visit are: Lake Argyle, Bungle Bungle, Ord River, Bullo River Station, El Questro, Cambridge Gulf, Kimberley Coast, Berkeley River, King George Falls, Mitchell Falls, Cockburn Range, Hunter River, Mount Trafalgar, Careening Bay, Naturalist Island, Drysdale River, Kalumburu, Prince Regent River, Argyle Diamond Mine. 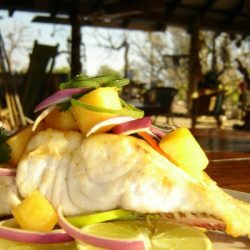 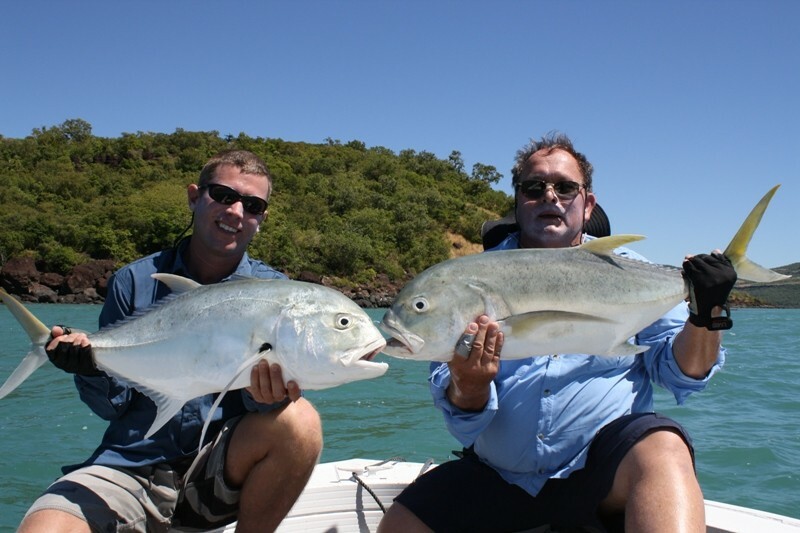 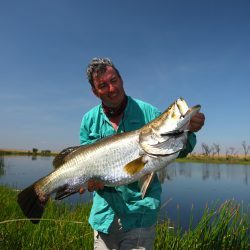 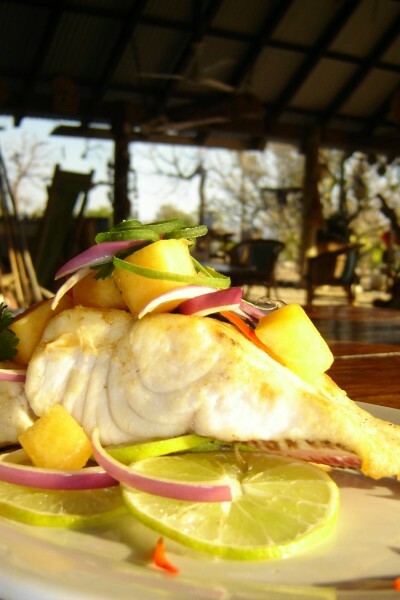 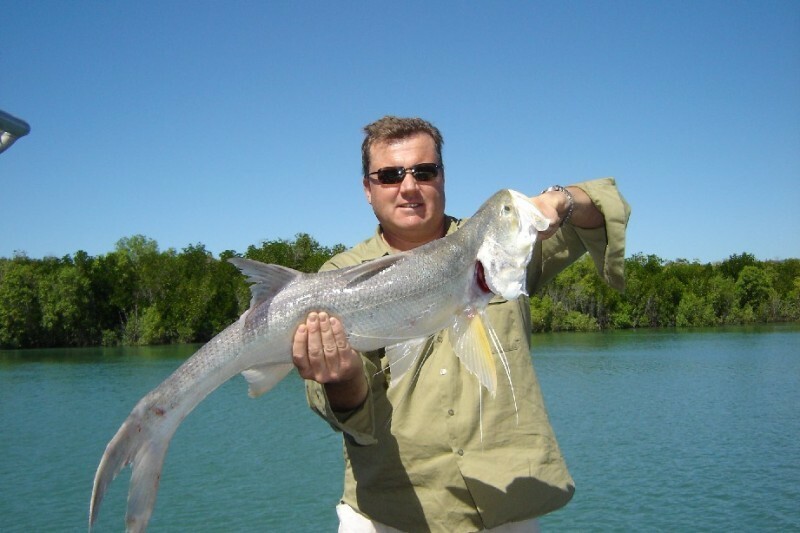 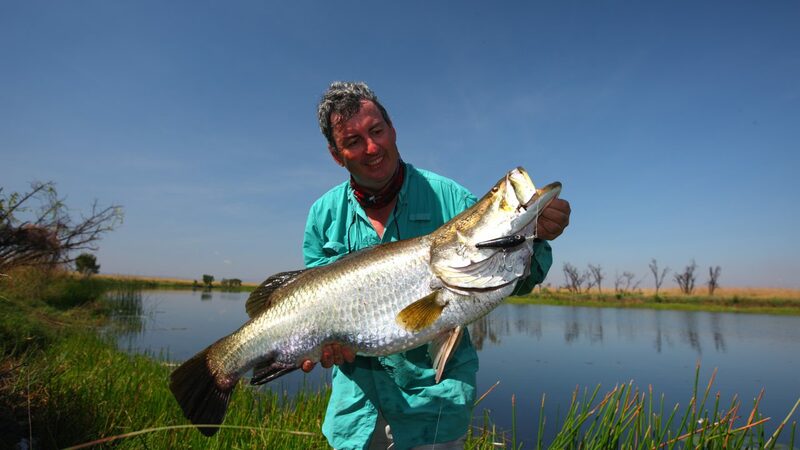 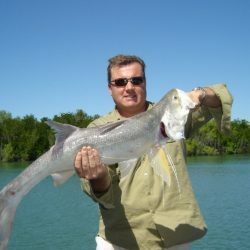 April and May offer the best time for Barramundi fishing and the waterfalls will be flowing well. 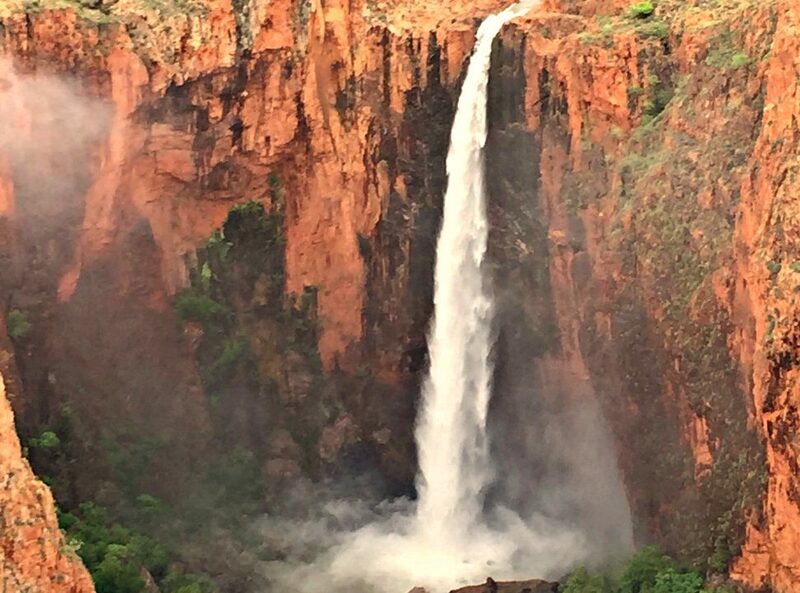 The landscape is still green after our monsoonal Waterfall season. 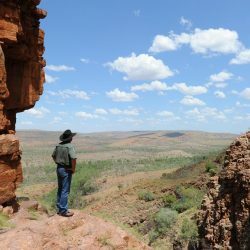 June to August are our cooler months, with September and October starting to warm up as we head towards the end of year. 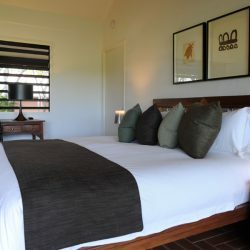 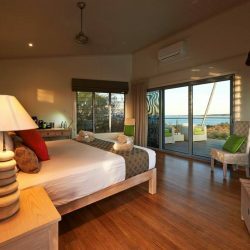 We can assist with booking Kununurra accommodation for post tour and highly recommend Freshwater East Kimberley Apartments, Kununurra’s only 4.5 star apartment hotel set in resort style grounds overlooking Lily Lagoon. 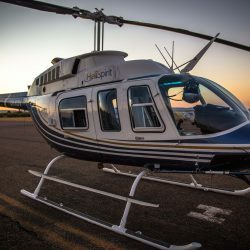 Bell 206 Jetranger: Turbine engine, leather interior, very good viewing platform. 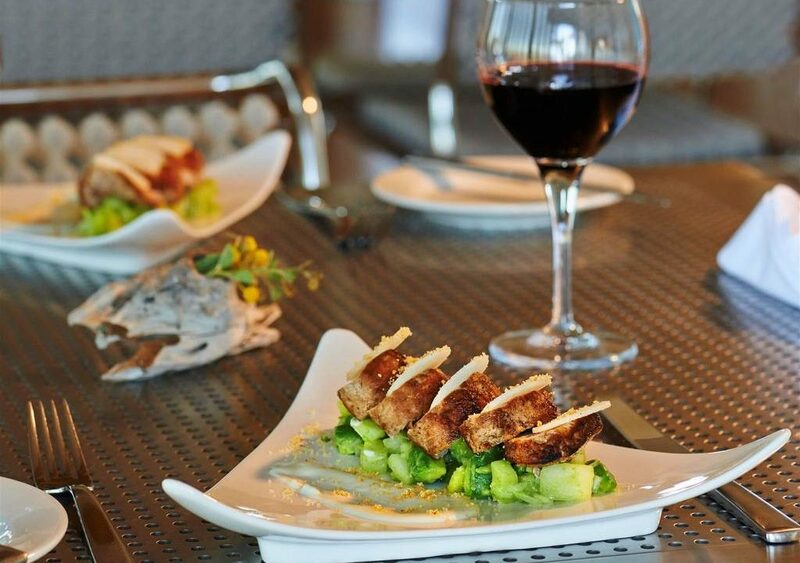 Suitable for 2 or 3 passengers in comfort on this itinerary. 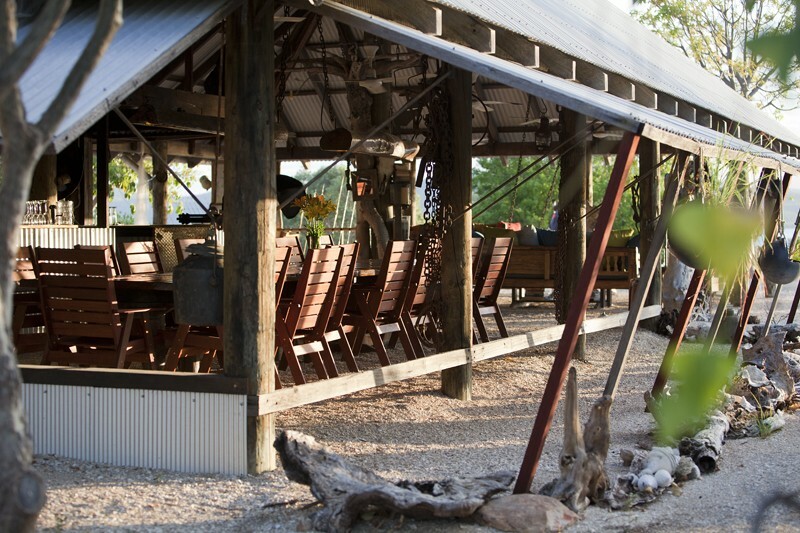 4 passenger seats are available. 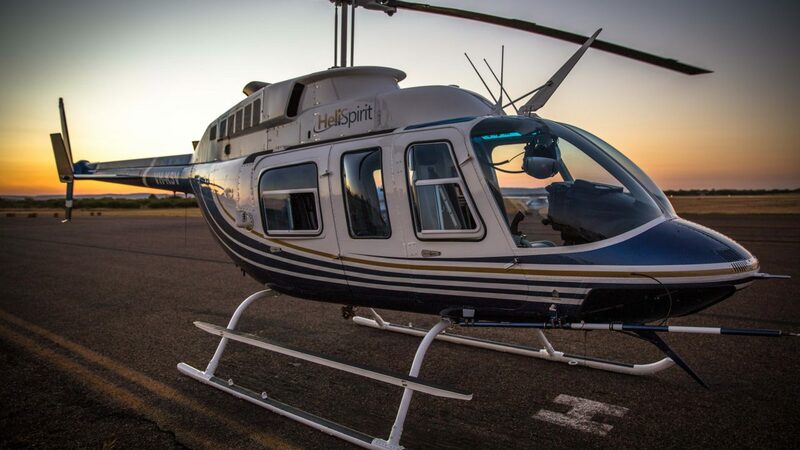 Bell LongRanger: Turbine engine, leather interior, very good viewing platform. 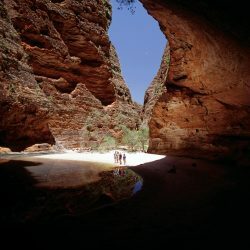 Suitable for 4 passengers in comfort on this itinerary. 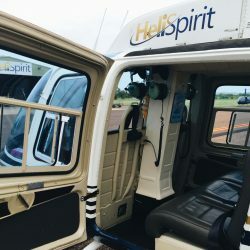 6 passenger seats are available. 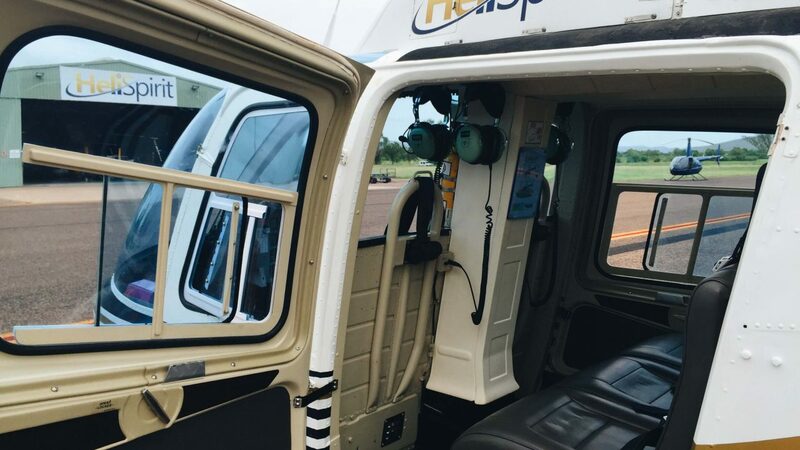 Robinson R66: Turbine engine, airconditioned, leather interior, excellent viewing platform. 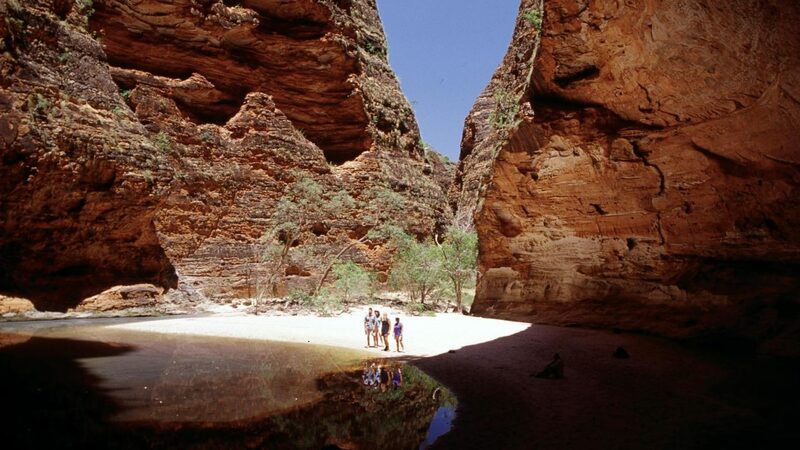 Suitable for 2 or 3 passengers in comfort on this itinerary. 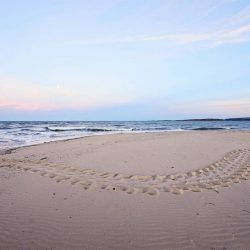 Click here to see our fleet description.